A recent conversation I had with Connie jogged my slow memory about Flip Wilson and his character "Geraldine" . I do distinctly remember liking to watch the show just to sneak a peak at what "Geraldine" was up to. This was way back before even the term transvestite had entered my vocabulary, let alone transgender, His show aired from 1970 through 1974. My closet in those days was built with heavy concrete blocks! If you remember Geraldine, she was fond of saying "The devil made me do it." I wondered to myself if the devil was making me wear girls clothes and thought well, the devil was showing me a good time! 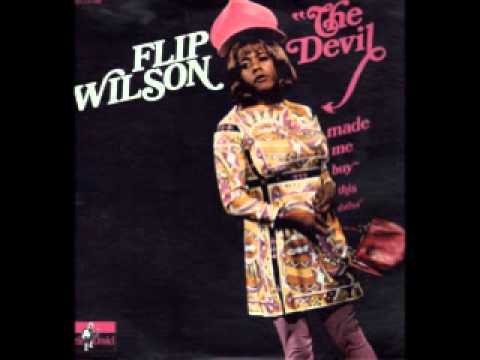 Those were my college days, when the Flip Wilson Show was on TV. I had gone into my "Great Suppression" in 1968, after a fairly regular closeted cross dressing life of six years. I was very aware of the term, transvestite, and sexual deviant, too. As was my sneaky way in those days, I took Psychology courses as a way to safely research my "condition" (which, of course, I had overcome with pure will power...push down the urge and live with the purge). Wilson's character, Geraldine, was of interest to me academically, and I was very attuned to what others were saying about the characterization. This is, of course, pure fantasy. My mother would never have said that!